I enjoy interacting with students and believe that students are the most important asset of a university. My main objective is to ignite passion for artificial intelligence and robotics in my students. All of my educational activities build on the following beliefs: First, I believe that it is important that teachers be able to both motivate and challenge students. Second, I believe that it is important that teachers promote excellence. Third, I believe that it is important that teachers provide students with a firm foundation of the basic material in a field but also expose them to recent research results. Fourth, I believe that it is important that education encompasses more than teaching in the classroom. Finally, I believe that it is important that teachers encourage students to do research early in their careers. I received the Dean's Award for Innovation in Teaching and Education in 2015. 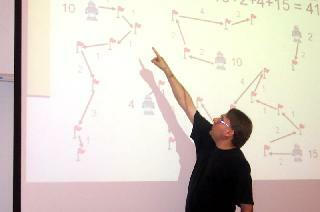 I taught the graduate introduction to artificial intelligence class (CSCI 561) on a regular basis. I taught the undergraduate introduction to artificial intelligence class (CSCI 460) and the graduate advanced artificial intelligence class (CSCI 573) from time to time, and have modernized the topics taught in all three classes. In Fall 2014, I transformed CS460 (a class intended for seniors) to CS360 (a class intended for juniors) by developing new slides and an extensive set of assignments with sample solutions (to help younger students understand the material) and have taught CS360 every semester since then. I have also developed two new classes in my research areas, namely the "Advanced Topics in Search and Planning" class and the "Decision-Theoretic Planning" class. I teach interactively, building on techniques that I learned in a CRA workshop on "Effective Teaching in Computer Science and Engineering." For example, I tend to go back and forth between prepared slides, the whiteboard and discussions with students (even with more than 100 students). This teaching style allows me to show my enthusiasm for the material (which students always comment on very positively) and, at the same time, to test to which degree the students understand the material. I have consistently received good student evaluations for the undergraduate and graduate classes that I teach (typically 4.0 or above on a scale from 1.0 to 5.0), Two of my teaching assistants won best teaching assistant awards for CSCI 460, one in Spring 2004 and one in Fall 2007, and two of my teaching assistants won best teaching assistant awards for CSCI 360, both in Spring 2016. I consider class projects to be a cornerstone for learning, which led me to start the "Computer Games in the Classroom" project. The idea is to use video games to motivate students to learn both traditional concepts from computer science and recent research results. I decided to use video games as motivation since students typically find video games fun to play and are thus curious about how to create them. So far, I have developed three complete "open-source" project texts (plus data sets and helper programs), each of which teaches a concept from artificial intelligence on about 10 (or more) pages in the style of a textbook and contains a variety of project questions, including easy questions, hard questions and open-ended research questions. These projects have been used not only in my own classes but at other universities as well, including the University of Nevada at Reno, the University of Central Florida and Massachusetts Institute of Technology, and were chosen as "Model Artificial Intelligence Assignments" by the Symposium on Educational Advances in Artificial Intelligence 2010. I believe that it is important for teachers to allow students to continue their learning experience outside of the classroom. For example, I am the faculty advisor of the USC AAAI chapter that is led by undergraduate students. I also started with David Kempe the USC Programming Contests for undergraduate and first-year graduate students from all disciplines to provide them with additional education opportunities in computational problem solving, an important skill that is difficult to teach in the classroom. I co-organized and raised funds for many USC Programming Contests (which were each attended by about 40 students) and coached several USC Teams during evenings and weekends for the ACM Southern California Regional Programming Contests, where USC students quickly became top performers among the about 70 participating teams, for example, came in 2nd in 2006 and 1st in 2012 (and went on to the world finals) - against a strong competition that included California Institute of Technology, UC San Diego, UC Los Angeles, UC Santa Barbara, UC Irvine, UC Riverside and many others. I received a Mellon Award for "Faculty Mentoring Undergraduate Students" in 2009 for this effort. Others have taken it over since about 2013 and made sure that USC students continue to be top performers in the contests but I continue to maintain the contest webpages. I also provide research opportunities for interested undergraduate and graduate students. I start out as a close collaborator and then allow students to become more and more independent, until I only give advice and provide quality assurance. I believe that it is important for them to choose their own research topics and for me to find funding for these topics. I encourage them to learn about related work in other disciplines and not to be afraid of making unusual connections. To further these objectives, I initially involve them in my interdisciplinary research collaborations as much as possible. I enjoy advising undergraduate students and writing research publications with them, and have done research both with undergraduate students from Georgia Institute of Technology and USC and, via the USC Research Experience for Undergraduates Site on "Coordination, Communication, Autonomy: Principles and Technologies," also with undergraduate students from other universities who visited USC during the summer. For example, one of my undergraduate students from Georgia Institute of Technology won two of eight main awards at the UROC competition in 1999. One of my undergraduate students from USC received a Rose Hills Foundation Science and Engineering Fellowship in 2009, and four other undergraduate students (all jointly advised with research scientist T.K. Satish Kumar) received the Computer Science Award for Excellence in Research in 2014 (resulting in a publication at ICAPS 2014), 2015 (resulting in a publication at AAMAS 2016), 2016 and 2017, respectively. My "Programming Pinball Machines" project investigated how to teach concepts from computer science and robotics in a fun way to undergraduate students by letting students develop games on (actual) pinball machines. This research project was supported by both NSF Research Experience for Undergraduate funds and the USC Fund for Innovative Undergraduate Teaching. It involved five undergraduate students, three Master's students and one Ph.D. student. We developed a pinball machine interface between a PC and a recent pinball machine (that controls all aspects of an existing solid-state pinball machine without having to modify its hardware) and demonstrated that it is easy to innovate pinball games by designing and implementing Pinhorse, a novel pinball game with an unusual multi-player mode. Our first feasibility study resulted in a youtube.com video that has been viewed about 10,000 times and in me teaching a small pilot class on "Designing and Implementing Games on Pinball Machines" in Fall 2008 despite me not being able to receive teaching credit for it. Several of the undergraduate students were co-authors of conference and workshop publications on the project, and one of them became first a Ph.D. student at USC and then an assistant professor at UC Riverside. Our hardware and software has subsequently been used for research at the University of Alberta. I received the Computer Science and Engineering Undergraduate Teaching Award in 2017 from the IEEE Computer Society "for his commitment to engaging students through project-based learning and mentoring that cultivates a passion for artificial intelligence." I also enjoy advising graduate students. My graduate students got rewarded with several awards (including best paper, best dissertation, best research assistant and best teaching assistant awards), and I received an SAIC Advisement Award for my efforts. My Ph.D. student William Yeoh became an assistant professor at New Mexico State University and was selected by IEEE Intelligent Systems in 2016 as one of the "AI's 10 to Watch" ("10 young stars in the field of AI," chosen every two years from researchers around the world), my Ph.D. student David Furcy became an assistant professor at the University of Wisconsin at Oshkosh, my Ph.D. student Yaxin Liu became a research scientist at the University of Texas in Austin (and is now at Google), my long-term collaborator Maxim Likhachev (with more than 15 joint publications since he was a graduate student) became a research assistant professor first at the University of Pennsylvania and then at Carnegie Mellon University, and my post-doctoral researcher Michail Lagoudakis became an assistant professor at the Technical University of Crete. I am also passionate about helping students and young researchers to get a good start in their careers outside of USC. On the high-school level, I repeatedly represented the Association for the Advancement of Artificial Intelligence (AAAI) as a judge at ISEF (3 times), which brings together over 1,400 high-school students from more than forty nations. On the university level, I frequently serve as external member on dissertation committees (10 times), participate as panelist or mentor in doctoral consortia of artificial intelligence conferences (15 times), present tutorials on my research at summer schools and conferences (10 times) and was co-chair of the student abstract and poster program of AAAI (3 times) and the doctoral consortium at ICAPS in 2015, that both allow graduate students to get feedback on their research from experienced researchers in the field. During my two years as program director at the National Science Foundation (NSF), I helped to manage the Research Experiences for Undergraduates (REU) Sites program and helped to initiate the NSF European Extended Lab Visit Program for Graduate Students in Artificial Intelligence and Robotics. During my three years as chair of the ACM Special Interest Group on AI (SIGAI), I helped to initiate the AAAI/ACM Dissertation Award and two student essay contests, where students could win not only cash prizes but also skype conversations with famous AI researchers (including the Director of Research at Google and the Director of Microsoft Research Labs). Finally, I co-chaired the Symposium on Educational Advances in Artificial Intelligence (EAAI) in both 2016 and 2017. I was also the chair of the award committee for the inaugural AAAI/EAAI Outstanding Educator Award in 2016, again a member of the committee in 2017, and a member of the award committee for the Computer Science and Engineering Undergraduate Teaching Award of the IEEE Computer Society in 2018.